Happy-go-lucky Sulochana (fondly known as Sulu), a suburban Mumbai housewife, lives with her husband, Ashok, a sales manager in a traditional company that sells uniforms, and their 11-year-old son, Pranav.Sulu keeps herself entertained through the day, which includes listening to her favorite radio station and taking part in every possible contest. Sulu breezes through life with a fun and candid never-say-never attitude. On a day like any other, Sulu ends up winning a pressure cooker through a radio contest that she has taken part in. Little does she know that her trip to the radio station is about to change her life.In an unexpected turn of events, she lands a job of an RJ (radio jockey). She is no ordinary RJ for she is made to anchor a night show, which involves chatting with peculiars, strangers and lonely souls. 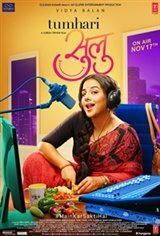 A husband in constant battle at a mid-level job, a precocious child who is up to something alarmingly strange in school, and a woman who unpredictably stumbles into the world of radio?.Seasoned with music, humour and quirk, Tumhari Sulu witnesses the everyday grit of a housewife, a marriage put to test and a world that struggles to see the beauty of a so-called 'simple, ordinary life'.From the team of Neerja, comes a charming slice-of-life family feature, which will warm the cockles of your heart.